Jumbo Map Cabinet. Image: Texas General Land Office. Where do you store a map that’s nearly eight feet long and almost seven feet wide? You can’t just walk into your local office supply store and pick up a ready-made cabinet. 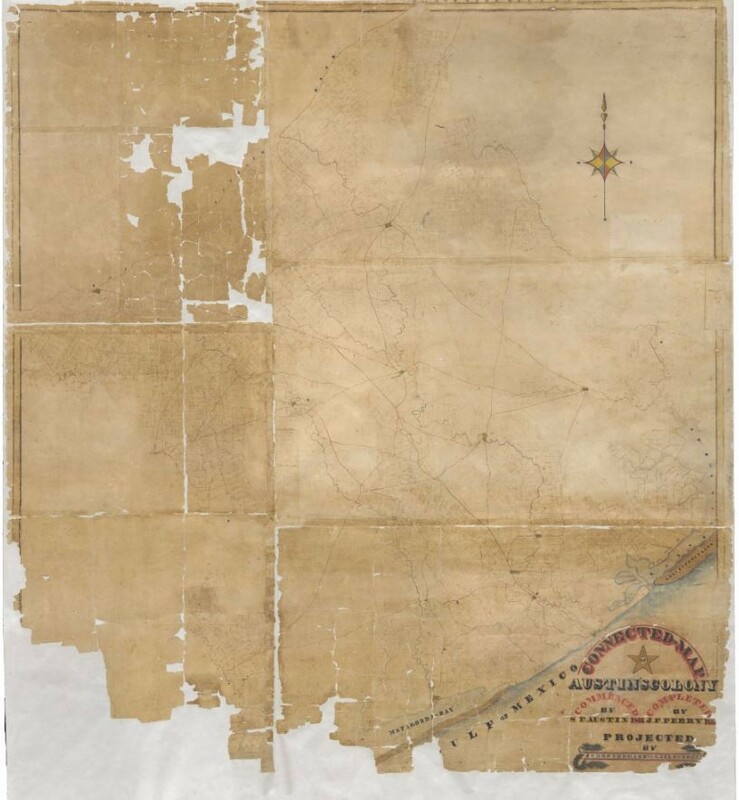 Such was the problem for the map curators at the General Land Office when it came time to preserve one of the GLO’s most important maps, the Connected Map of Austin’s Colony (1833–1837). Stephen F. Austin and James F. Perry, Connected Map of Austin’s Colony. San Felipe and Peach Point Plantation, TX: Unpublished manuscript, 1833–1837, Map #1943, Map Collection, Archives and Records Program, Texas General Land Office, Austin, TX. Conservation of maps and documents is a cornerstone of the mission of the GLO Archives and the Save Texas History program. In 2002 the Connected Map was sent to the Northeast Document Conservation Center in Andover, Massachusetts for conservation treatment. It’s quite a large item — measuring 90.6” x 80.9” — and before treatment the only way to store it was rolled, which is far from considered a best practice for the long term survival of the map. Part of the treatment was to flatten the map, which made it necessary to procure a cabinet large enough to permanently house it where it would lay flat. Finding such a cabinet was no easy task. Nothing that fit the needs of the GLO was readily available, so a custom cabinet had to be constructed. The cabinet was designed to meet archival standards, and, crucially, it had to be operational in time for the return of the Connected Map to the GLO. Items slated to be housed in the new cabinet included the Connected Map and several other (very) large format items that required special housing due to their size. The vendor, Acratod of Austin, Inc. (later bought by TAB Products, Inc.), was selected and construction began on the metal cabinet that the oversized maps would soon call home. 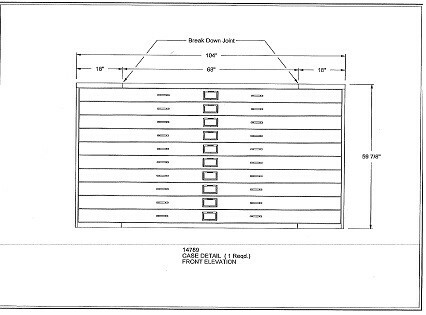 Case detail of front elevation drawing provided by Rene Drouin, TAB Products, Inc. The cabinet had to be constructed of metal because wood drawers would have led to “offgassing.” Offgassing occurs because acidity in the wood can release volatile substances, causing certain gasses to build up if the drawers are closed for long periods of time (as they would be once the cabinet was installed). The acidity level could potentially rise inside the drawer, causing the enclosed documents to stew in their own acidic juices, which would in turn eat away at the paper. Although the Connected Map was being deacidified, there was a possibility that other documents that hadn’t yet been treated would be housed in the same cabinet, which would create the threat of potential offgassing. Once it was completed, the cabinet measured 126” long (10.5 ft.), 104” wide (8.6 ft.), and 59 7/8” tall (4.9 ft.), without the legs. Because of its size, it is referred to as the “Jumbo Cabinet.” There are a total of ten equally-sized drawers which measure 99.5” wide (8.2 ft.), 125.5” long (10.45 ft.) and 3.75” deep. H.L. 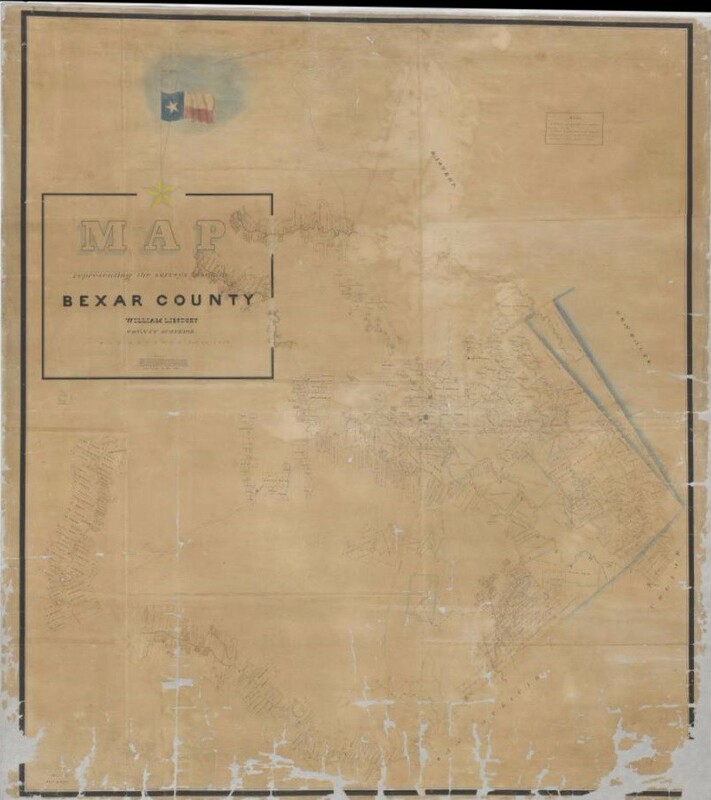 Upshur, Map Representing the Surveys Made in Bexar County, 1839, Map #1947, Map Collection, Archives and Records Program, Texas General Land Office, Austin. The massive cabinet created additional logistical problems to solve, which caused staff archivists to literally think outside the box. At the time, the GLO Archives, including the Map Collection, was located on the 7th floor, and not the 1st floor like it is today, and the size of the cabinet was larger than even the largest freight elevator within the Stephen F. Austin Building. The problem of transporting the two 10.5 ft.-long solid pieces of metal that formed the sides of the cabinet had to be solved. A wooden frame was constructed that would hold the pieces of metal as they rode to the 7th floor on the top of the elevator car. (The same process had to be repeated when the collection was later moved to its current location on the 1st floor.) You can only imagine the anxiety of building managers and GLO staff as this mega-sized cabinet rode through the elevator shafts. For map drawer enthusiasts (which I think we all are), the jumbo map cabinet once owned a bit of obscure notoriety — it was touted as the largest map case in North America. Others have since surpassed it, but it remains an impressive sight for those who take tours of the GLO’s Map Vault. The jumbo cabinet is home to a variety of types of maps in addition to the Connected Map of Austin’s Colony, which is the most important map housed at the General Land Office. 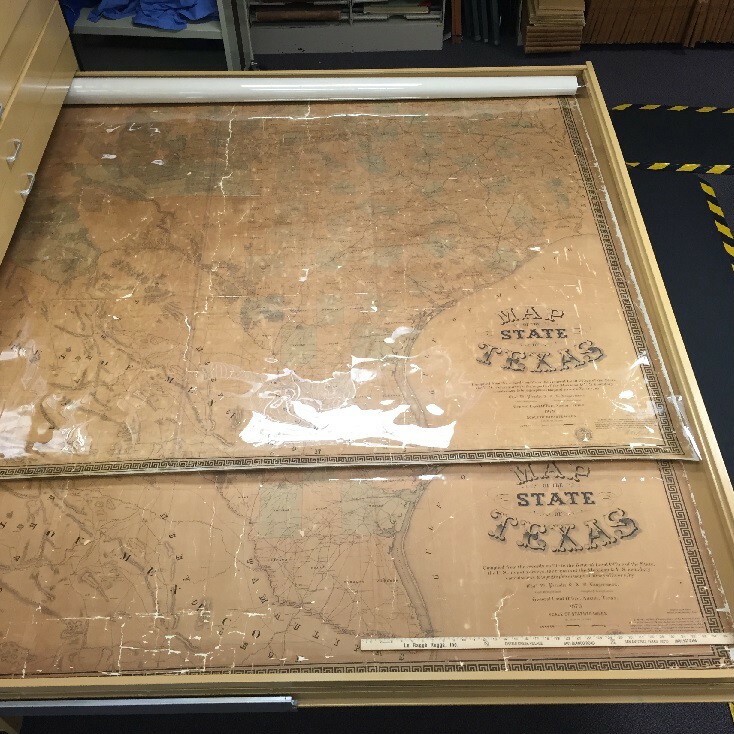 The jumbo cabinet also houses the GLO’s two copies of the largest map of Texas ever printed by traditional means (engraved or lithographed), the Pressler and Langermann Map of the State of Texas (1879). The Pressler/Langermann map measures approx. 8.5 ft. long x 8.9 ft. wide (102.7“ x 106.6”), and there are only four known copies of this map in existence. The cabinet also contains other state, county, and a limited number of city maps. Both hand-written manuscript maps and printed maps reside in the jumbo cabinet. Most are so large that it takes a minimum of two people to safely pull them and return them to their drawer, hence why digital scans have been so important to providing access to these records. The conservation of the Connected Map of Austin’s Colony was funded in 2002 with a donation from Gardere Wynne Sewell LLP. Digitization was funded in 2012 with a donation from the Daughters of the American Revolution. Thousands of documents in our collection are in dire need of costly conservation. We are attempting to raise funds for the Save Texas History program during the month of May by offering a commemorative Save Texas History t-shirt for a $30 donation, which supports the mission of the Save Texas History program. To donate and claim your t-shirt, click here! 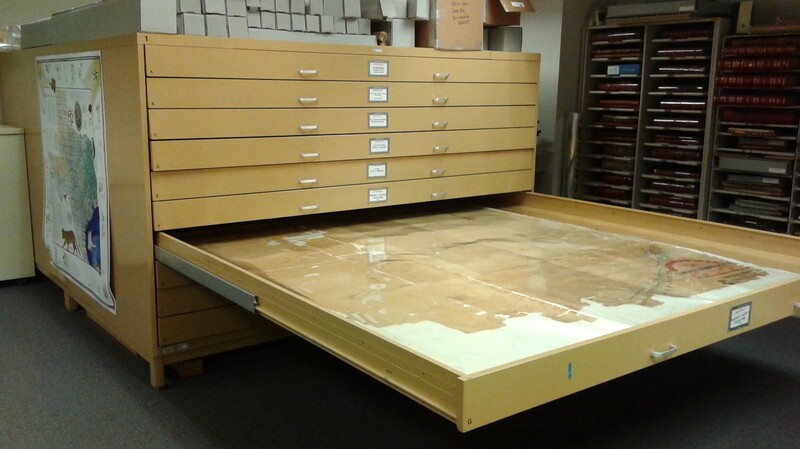 “Archival Storage Furniture: A Brief Review of Current Options,” Northeast Document Conservation Center website: https://www.nedcc.org/free-resources/preservation-leaflets/4.-storage-and-handling/4.2-storage-furniture-a-brief-review-of-current-options> Accessed May 11, 2016.